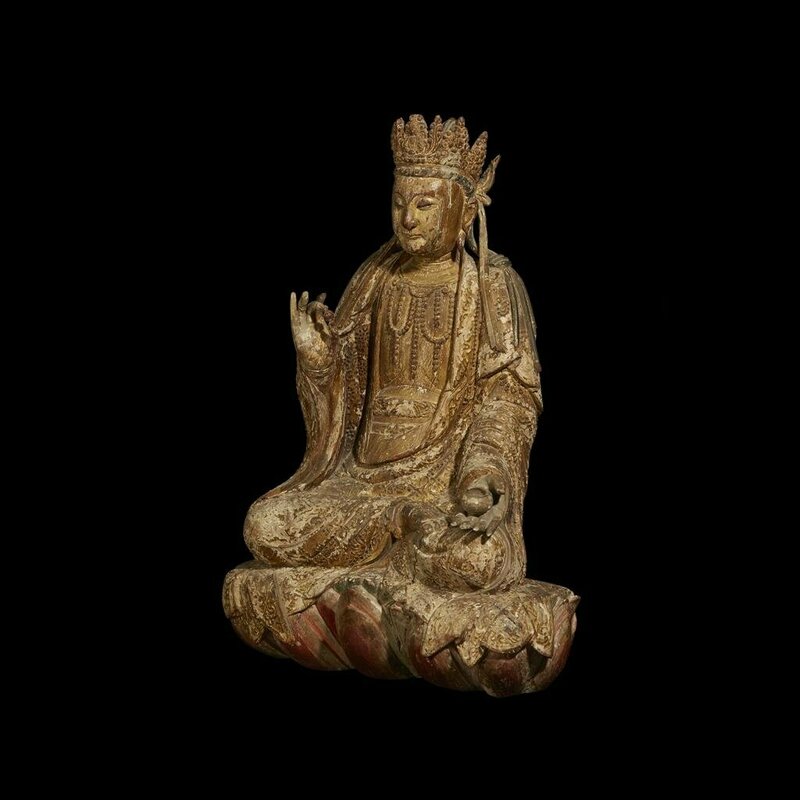 PHILADELPHIA, PA.- On September 9, Freeman’s launched its Fall 2017 season and helped kick off Asia Week with its biannual Asian Arts auction. With an active room and full bank of phone bidders, the exciting auction attracted a considerable number of new bidders and saw many lots sell wellabove their presale estimates. The 578-lot sale totaled just over $1.5 million. 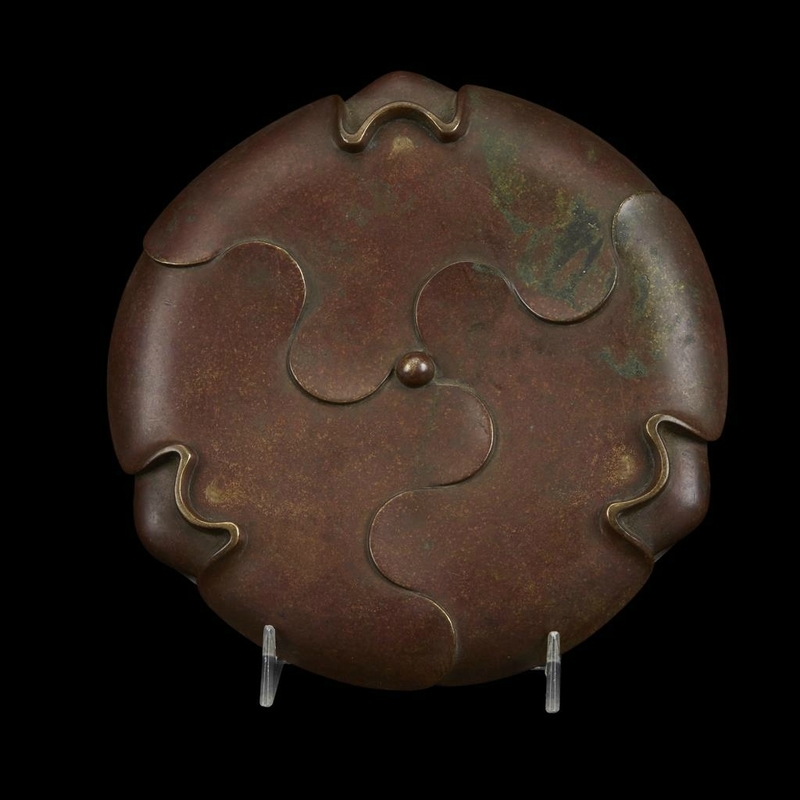 The auction offered fine examples of decorative arts, furniture, textiles, paintings and works on paper, highlighted by fresh-to-the-market property from various private collections and estates. 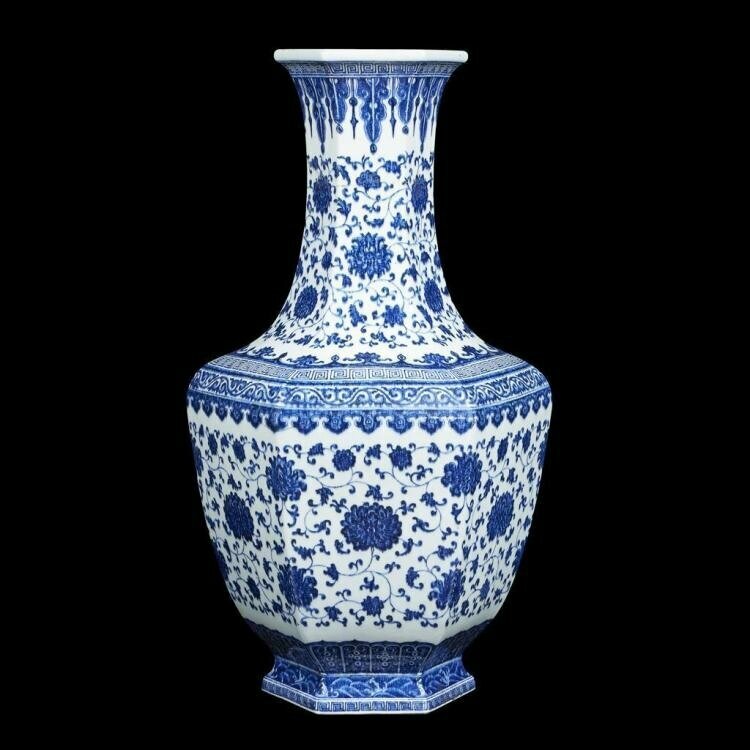 The runaway success of the auction was featured on the catalogue’s cover, an impressive Chinese blue and white porcelain hexagonal vase (Lot 287), Qianlong six-character mark and of the period. Vases comparable in scale and decoration are rare, and this Freeman’s example joins the small group of similar pieces to have been sold at auction. After a long bidding war, the vase went to a phone bidder for $143,750, greatly exceeding its presale estimate of $30,000-$40,000. Paintings and works on paper were standout sellers, with Chinese paintings performing exceptionally well. The highlight of this group was Lot 544, Tribute Bearers—an attractive and compelling ink and color on silk from the Chinese School that sold to a phone bidder for $112,500, almost 20 times its estimate. Shortly after, “Qui Shi Fu Shang Lin Tu,” (Lot 552) a Chinese painting depicting a landscape with palaces and pavilions and ladies rowing phoenix boats, followed suit and sold for five times its median estimate. Lot 544. Chinese School, Tribute Bearers. Ink and color on silk, with ten seals, framed and glazed; sight H: 8 3/4 in., 22.2cm; 43 1/2 in., 110.5cm. Estimate $4,000-6,000. Sold for $112,500. © Freeman’s. 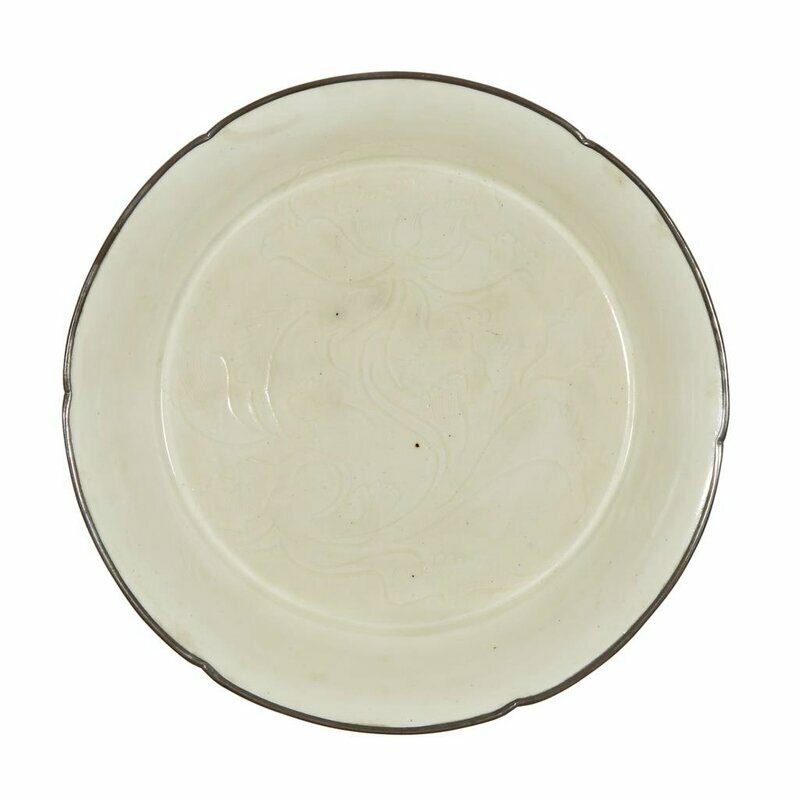 Lot 569, Fan Zeng’s (Chinese, b. 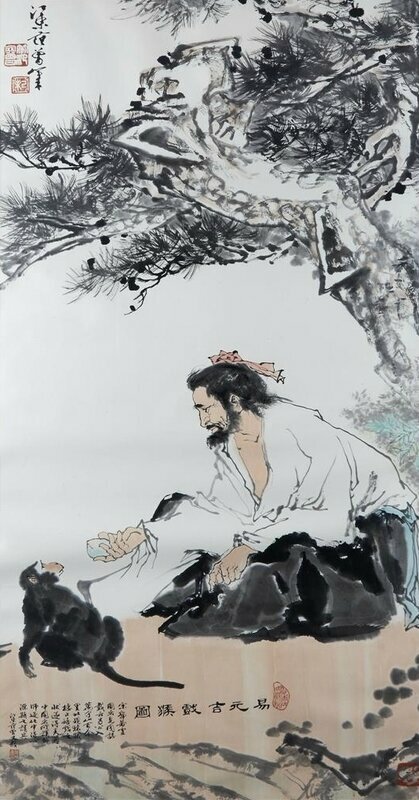 1938) “Yi Yuanji Playing with a Monkey” (Yi Yuanji Xi Hou Tu), was another of the sale’s highlights. This large and remarkable work portrays the Northern Song dynasty painter Yi Yuangi going into the wild and interacting directly with the monkeys he observed and painted. The ink and color on paper sold to a phone bidder for $93,750. Lot 569. Fan Zeng (b. 1938), 20th century, Yi Yuanji playing with a monkey (Yi Yuanji xi hou tu). Ink and color on paper, inscribed, signed, and with five seals, framed and glazed. Sight H: 54 in., 137.1cm; W: 26 1/2 in., 92.7cm. Estimate $50,000-80,000. Sold for $93,750. © Freeman’s. 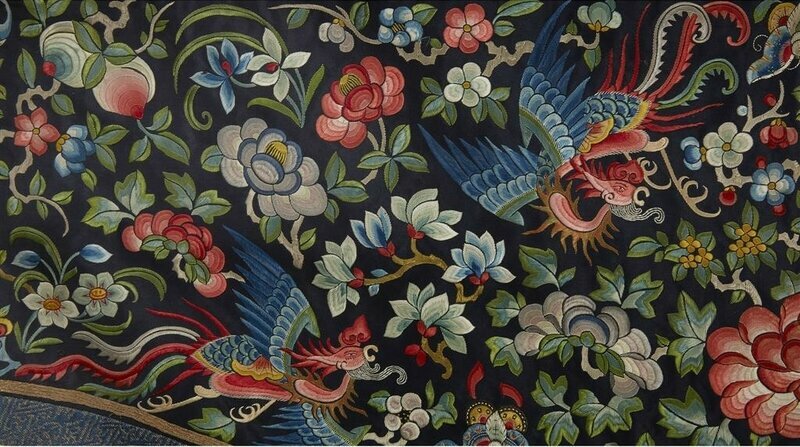 In addition to paintings and works on paper, Chinese decorative arts, furniture and textiles also performed well—a testimony to the continued strength of this market. 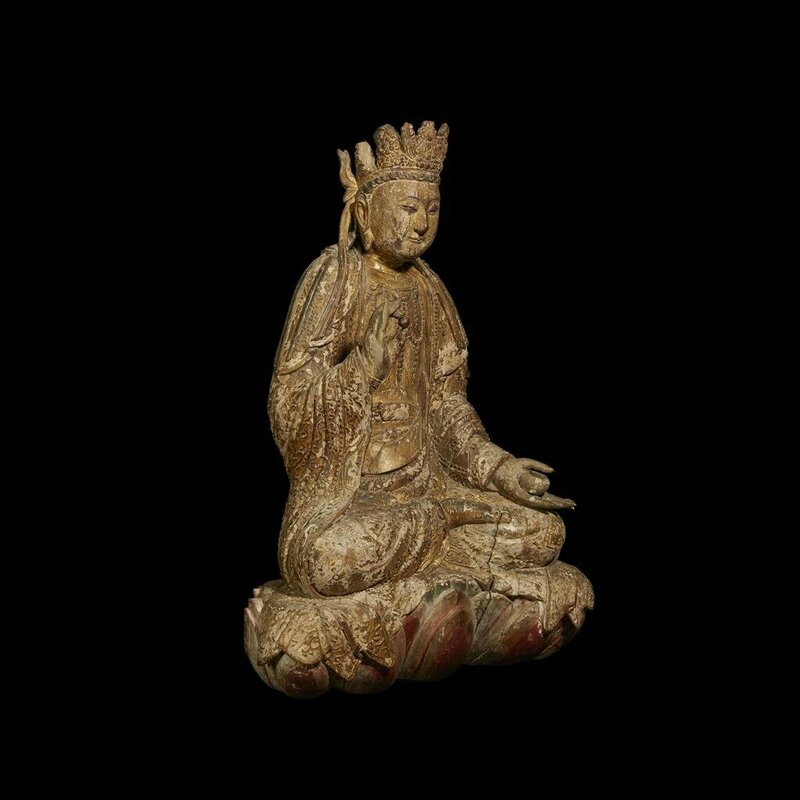 Lot 530, a carved gilt wood figure of a Bodhisattva from the Ming Dynasty, soared past its high estimate selling for $53,125. Immediately following, a Chinese patinated bronze tripod censer and foliate stand (Lot 531) sold for an impressive $62,500. Lot 530. 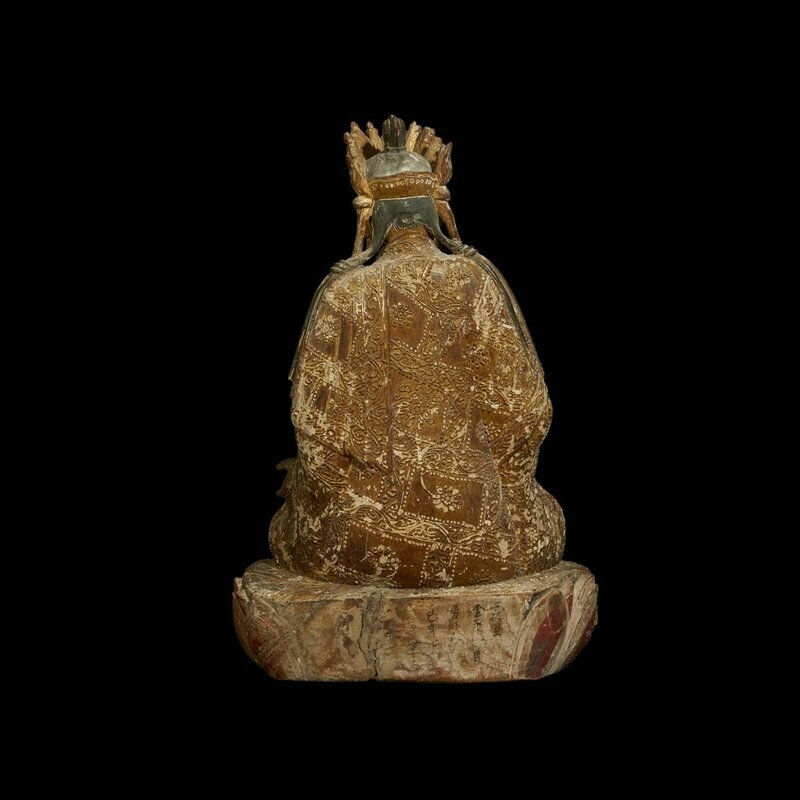 A Chinese carved, gesso-decorated and gilt wood figure of a Bodhisattva, Ming dynasty. Overall H: 24 in., 61cm. Estimate $20,000-30,000. 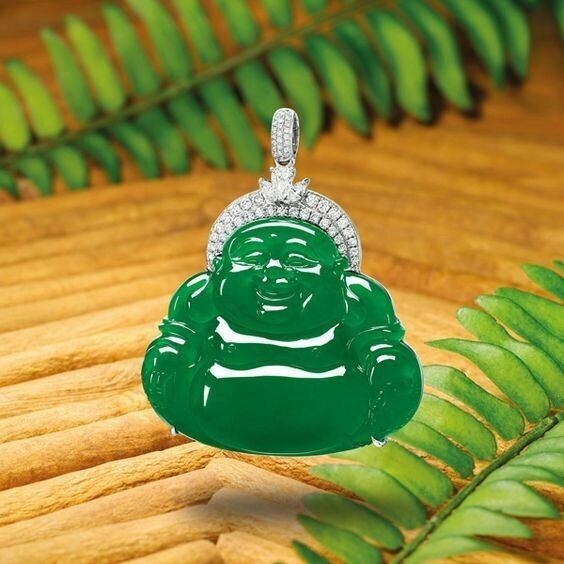 Sold for $53,125. © Freeman’s. Seated in padmasana on a painted lotus, clad in elaborate draperies with raised gesso flower and scroll-patterns, wearing bodhisattva jewelry, and a five-leaf crown with trailing streamers; one hand raised, a jewel held between the fingers, the other hand extended, bearing a "medicine" vessel. A partial ink inscription to back of base. Lot 531. 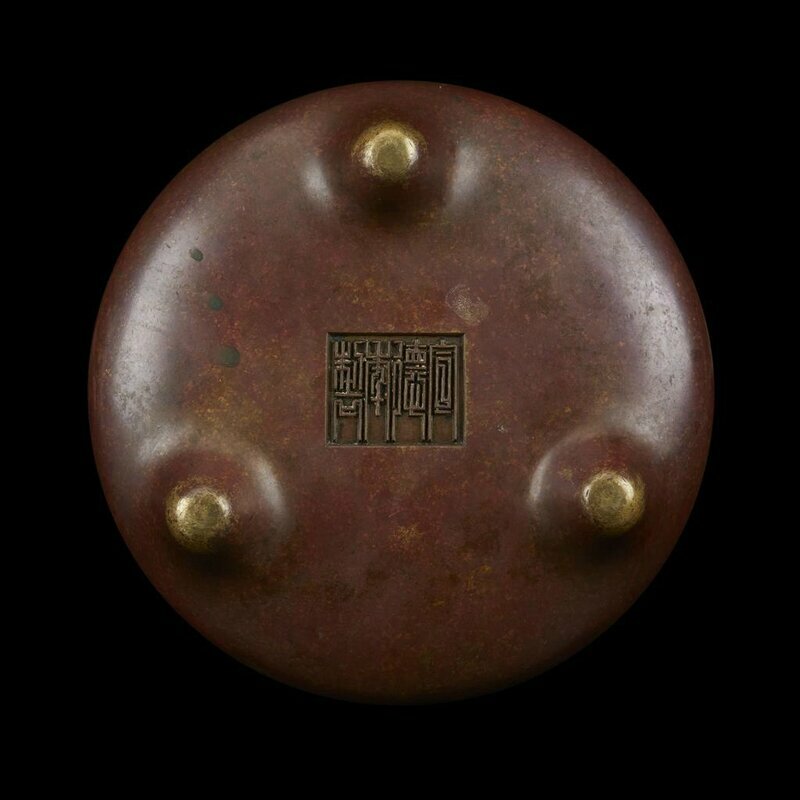 A Chinese patinated bronze tripod censer and foliate stand, Xuande mark, but later. Overall with stand H: 5 in., 12.7cm; D: 7 in., 17.9cm. Estimate $12,000-15,000. Sold for $62,500. © Freeman’s. Of compressed bombe form with shallow loop handles. 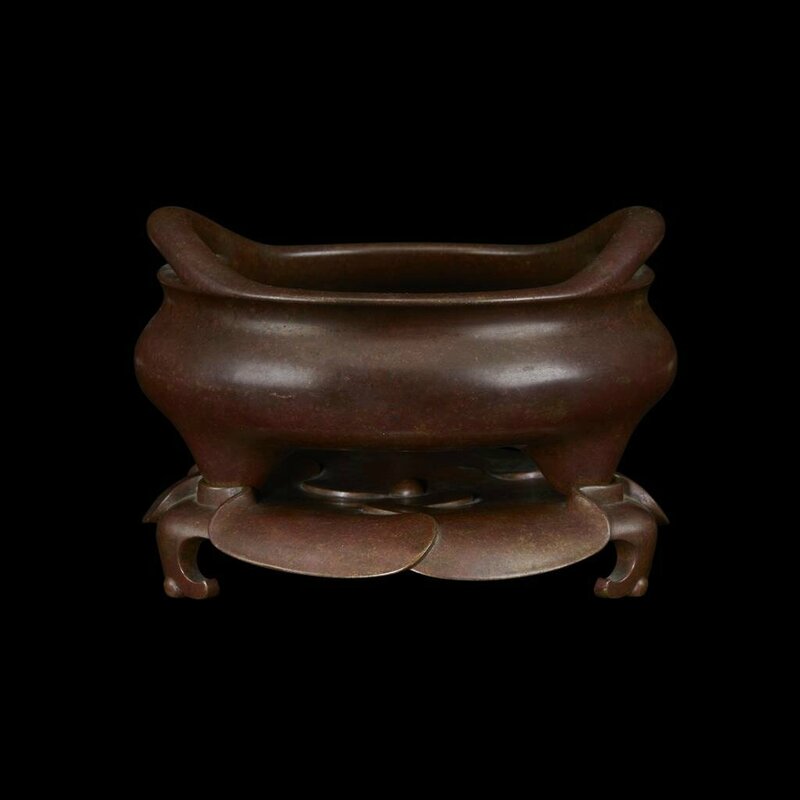 the base of mallow or hibiscus blossom form, on three stylized ruyi feet; underside of censer with four-character Xuande mark, mottled reddish-brown patina. Acquired in Beijing, March 2, 1993. 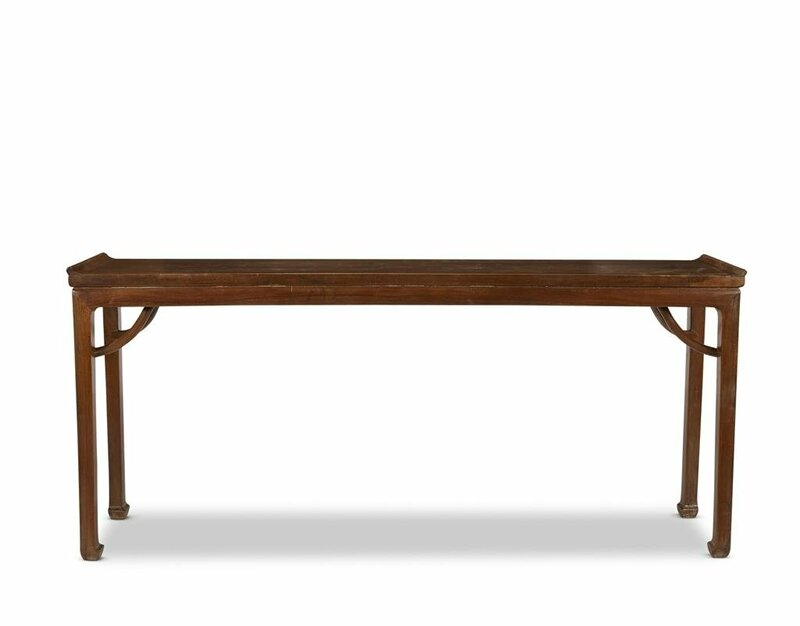 Furniture and textiles were also of interest to bidders as evidenced by Lot 378, a Chinese hardwood altar table with “Giant’s Arms” supports that sold for $31,250. 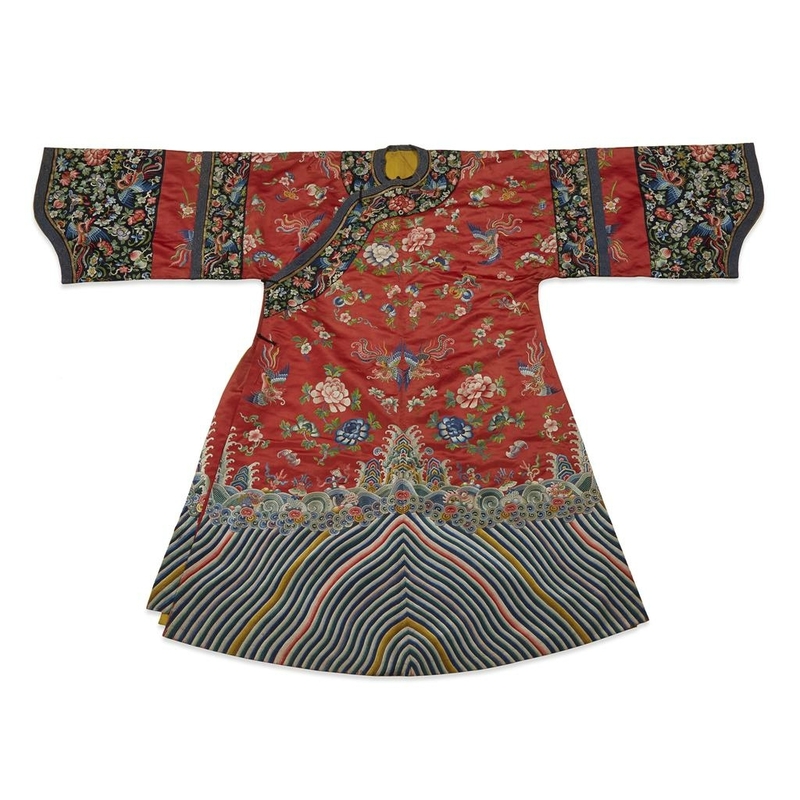 Lot 410, a Chinese woman’s embroidered red silk formal robe with phoenix and flower design, sold for $16,250. Lot 378. Chinese hardwood, possibly huanghuali, altar table with Giants Arm supports, possibly 17th-18th century with later additions; H: 32 in., 81.4cm; L: 74 in., 188cm; D: 14 in., 35.5cm. Estimate $15,000-20,000. Sold for $31,250. © Freeman’s. The dense hardwood with fine feathery grain, the rectangular top with raised ends, on square legs terminating in modified hoof feet, curved braces joining the legs and top. Lot 410. 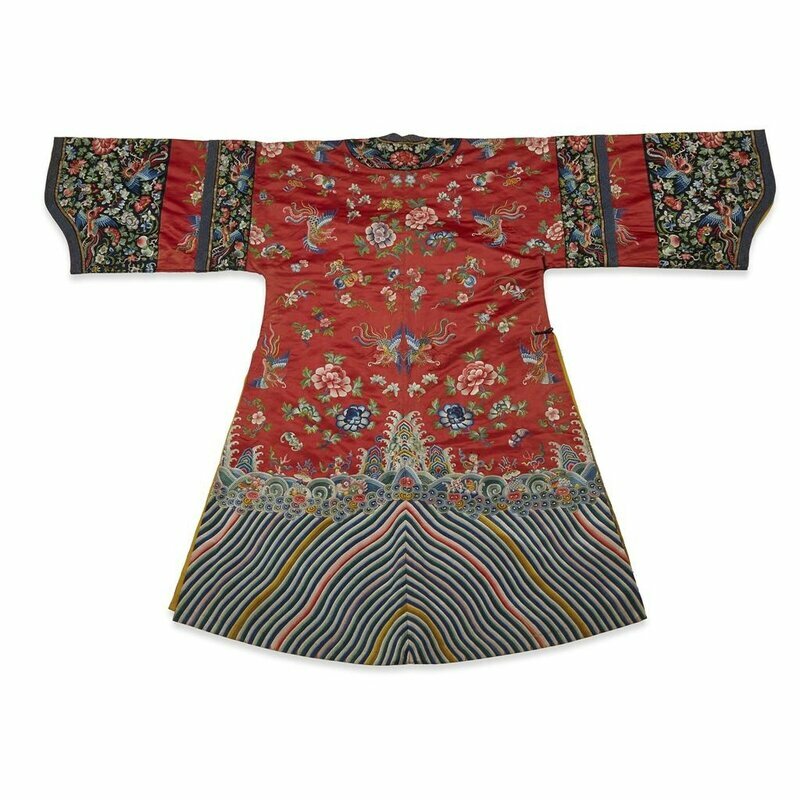 A Chinese woman's embroidered red silk formal robe with phoenix and flower design, late Qing dynasty. Estimate $4,000-6,000. Sold for $16,250. © Freeman’s. Provenance: Formerly in a Private Collection, Southern California. 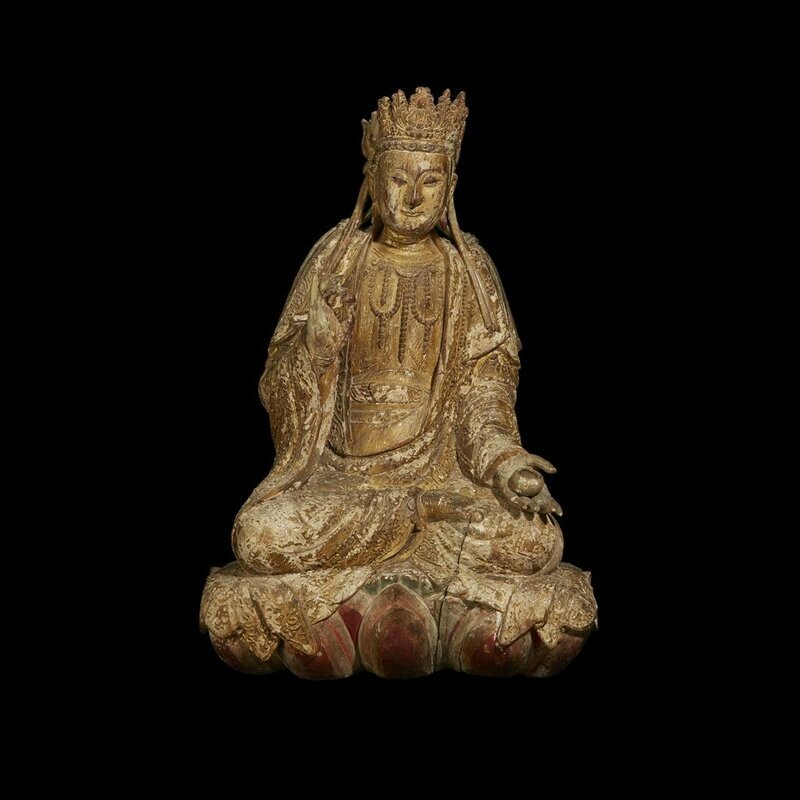 Freeman’s specialists in Chinese, Japanese, and Korean art have established an international reputation for record sales of Asian art. Department head Ben Farina says the department is always looking for consignments of interesting and unique pieces from China, Japan, Korea, and Southeast Asia, and looks forward to the next Asian Arts auction in Spring 2018.